All books are in color. They cover topics including: Housing, Breeding, Health, and General Care. Each book is $10 plus $3 shipping & handling. No shipping charges on orders of $50 or more. Guide to Owning a Corn Snake. 64 full color pages. Guide to Owning Rat Snakes. 64 full color pages. Pine Snakes: A Complete Guide. 64 full color pages. Kingsnakes: Care and Breeding in Captivity. 64 full color pages. 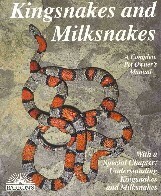 Kingsnakes and Milksnakes. 94 mostly color pages.